About as decent as their earlier release from the Garden Of Delights label, 'Close Encounter With The Third One' (CD 036), maybe a touch better. The band comes from Cologne, Germany. 'Bremen 1972' was professionally recorded live on April 19,1972 at a pub, Lila Eule. 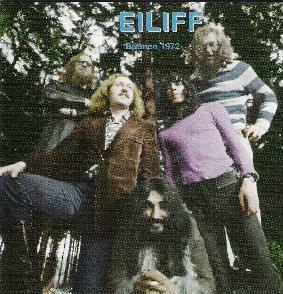 Apparently,the band's name, 'Eiliff', is supposed to mean "I Live". Makes sense. The disc has just two cuts as "Journey To The Ego" (8:07), a cut from the band's second LP 'Girlrls' ('72) is a good avant garde type of track with some nicely played bass and drum grooves intact. "Suite"(33:35) that comes from the band's self-titled debut ('71) features some rather swift mood changes, going from high-energy riffs to a somewhat free form of jazzy spaciness. Good sax solo early in the tune. I didn't realize it until the second time I heard this CD, but 'Bremen 1972' is completely instrumental. Some might refer to this as intense 'head music'. It's definitely progressive jazz rock, 1972 style. The line-up here is: Houschang Nejadepour - guitar/sitar, Rainer Bruninghaus - keyboards, Herbert Kalveram - sax, Bill Brown - bass and Detlev Landmann on drums. Just might appeal to fans of Brainstorm, Embryo, Soft Machine and Agitation Free's 'Fragments' compilation disc. Comes with the traditional Garden Of Delights treatment of being accompanied with a 32-page full color informative booklet. For more information you can visit the Garden of Delights web site at: http://diregarden.com.